Diamond-Boy englisch - jean-studer-ags Webseite! 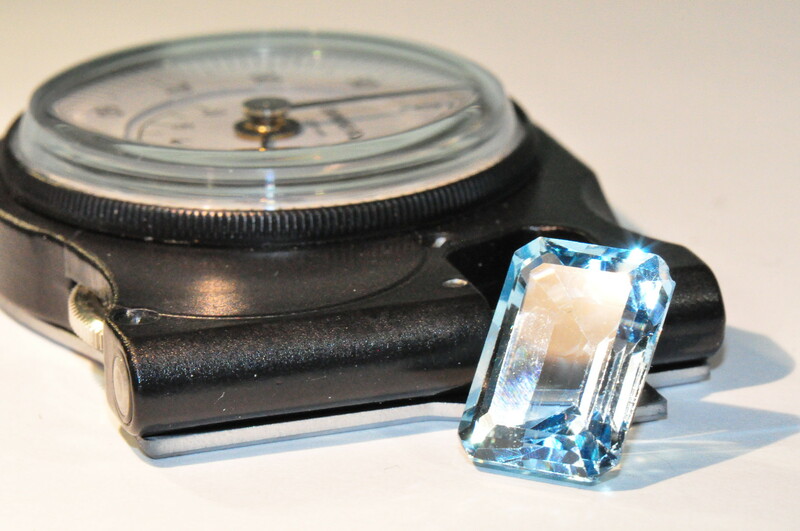 The Diamond-Boy will measure even the finest dust, and it is therefore most important to clean the measuring area from dust before adjusting the instrument. It is very light, weighing only 68 gr. It is as small as a pocket-watch. It is easy to handle and every measurement can be taken in at a glance. It can measure even one tenth of the diameter of a hair. The price is extremely advantageous. Every stone assorter will be very happy with the handy and precious DIAMOND-BOY, and once he has tried it he will not be able to do without this fine measuring instrument. This ever-ready helper should no more be missing from a diamond merchant, jeweller or stone cutter's work bench and vest pocket than a gem magnifying glass or a pair of tweezers. 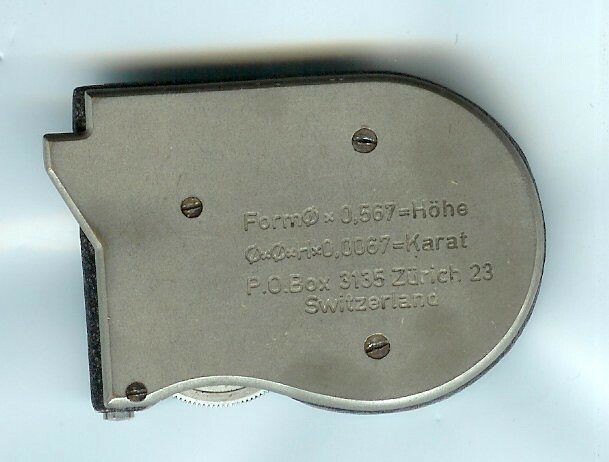 Its practical small size (no larger than a pocket watch, weight 68 gr.) 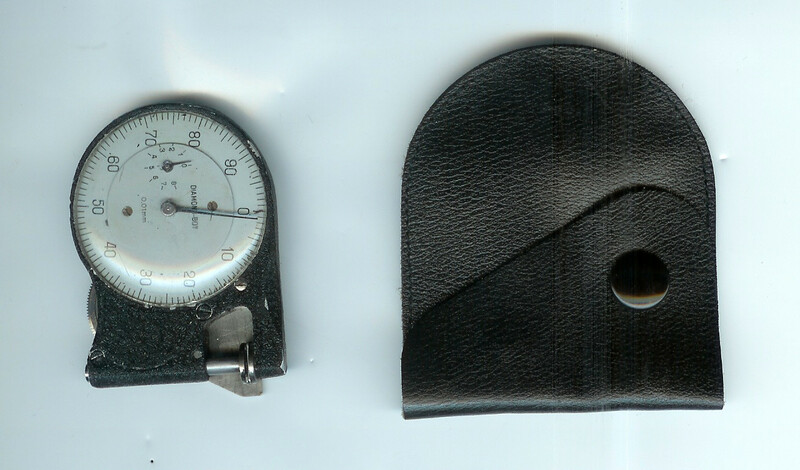 and its precision (measurements 10 times finer than a hair) make this instrument indispensable for delicate measuring. Scale division 1/100 millimeter, visible even up to 1/400 millimeter. 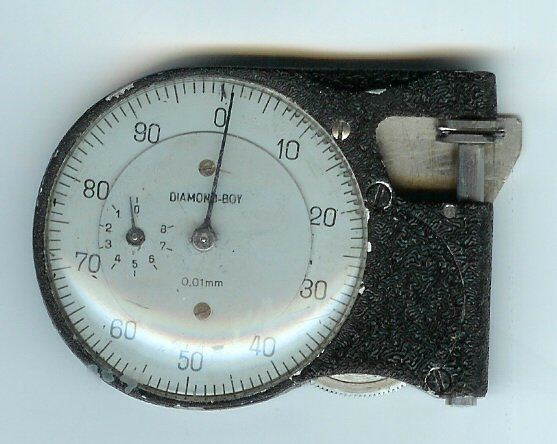 Even those for whom a scale division of 1/10 millimeter would do, prefer to use DIAMOND-BOY, whose scale division provides for 11100 millimeter, as this way 1/10 millimeter- measurements are more quickly and more easily read. 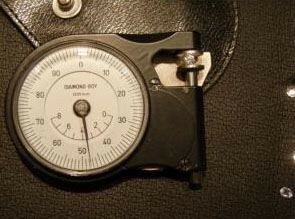 DIAMOND-BOY has a range of measurement up to 8 millimeters. The instrument has been developed mainly for small measurements. 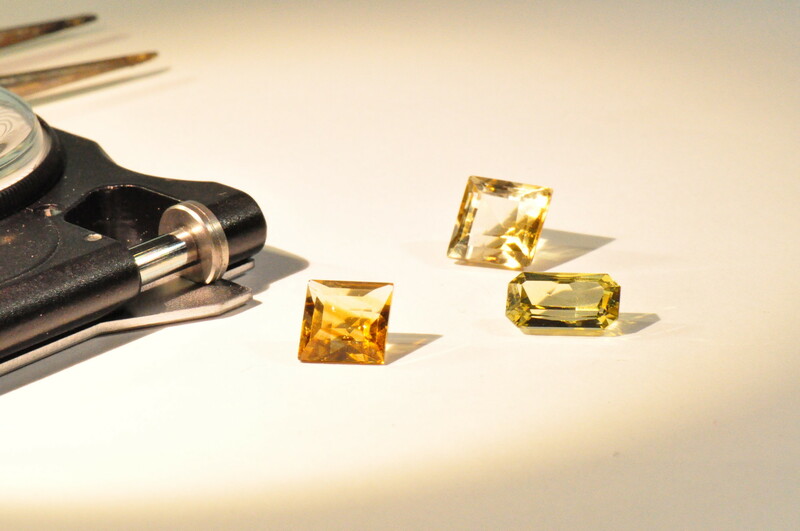 It has been proved that many more small stones have to be measured than large ones (ratio: for one 2 carat diamond measured, roughly one million smaller stones). 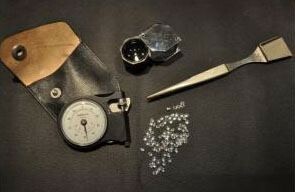 DIAMOND-BOY is especially recommended for measuring calibre, baguette and carré stones, These precise measurements are absolutely necessary for fine gems and spare the setter the hard work of weighing while setting stones, Inexact measuring with stone sieves is disappearing more and more. These measurements are no longer enough for today's much more precise and fine jewelry work. For example, if the stones fall on the sieve holes with their tables facing the holes, they remain there. However, the same stones fall through if they hit the same holes with their girdles upright. This way, there is a difference in diameter of 2 to 3/10 millimeter. With the piece of jewelry to be set, the setter is not interested in the weight but in the lenght and width of the stones, The stones measured with the sieve would be of no use for the fine bezel of a jeweled watch, due to inexact measuring. Every modern jeweler and setter is ordering more and more stones with exact measurements. Whereas formerly he asked for 5 carat diamonds - 20 per carat, he orders 5 carats of stones of for instance 2.2 millimeter diameter which for example, have been precisely measured to his order with a DIAMOND-BOY. The formula engraved on the back plate gives the exact weight of a normally cut diamond without the use of a scale. This fine measuring tool may also be used in other ways. By unscrewing the base plate, the DIAMOND-BOY may be used for fine measuring of all kinds, such as thread, wire, paper, leather, sheet-metal, beads ect. Make the test - measure on of your hairs, you will be absolutely astounded by the precision of this instrument!